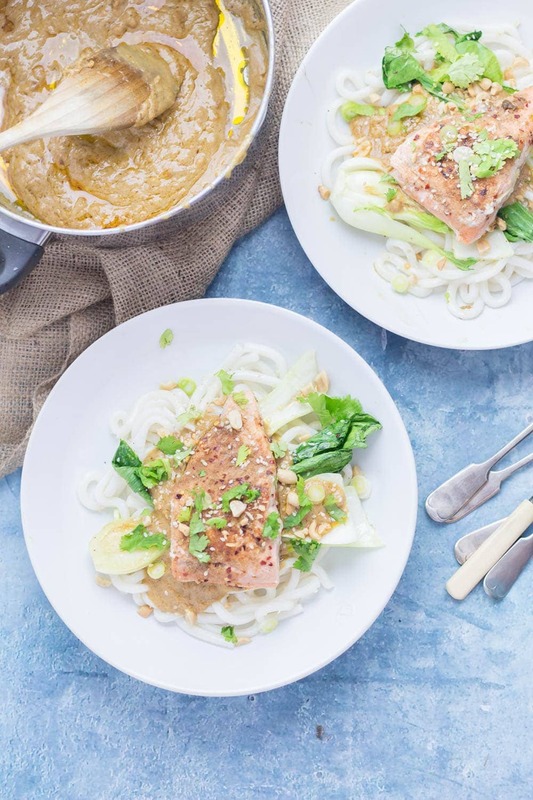 The sauce on this peanut salmon is to die for! 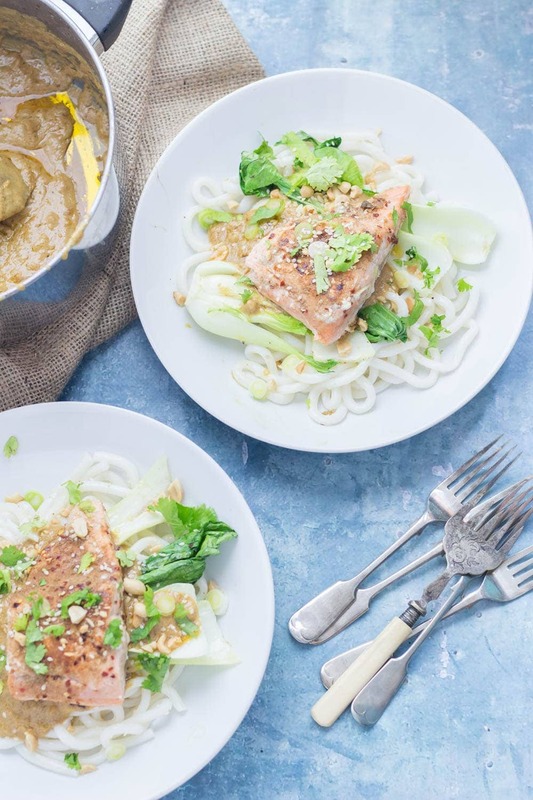 Perfectly flaky salmon sits on top of udon noodles and wilted pak choi with a creamy peanut sauce. It’s Decemberrrr! I’m so excited for Christmas this year. My parents are coming to us this year so it’s officially our first time ever hosting Christmas and we can’t wait to spend the day with them and have our first Christmas with Bernie the cat (who will be getting far too many presents from us, we are 100% crazy cat parents). Although I am feeling the pressure to make an amazing Christmas dinner. I’m thinking we should just stick with the classics but if you have any amazing Christmas recipes then hit me with them in the comments! Speaking of December, I just published my post about what’s in season in December including links to loads of tasty recipes using seasonal ingredients. 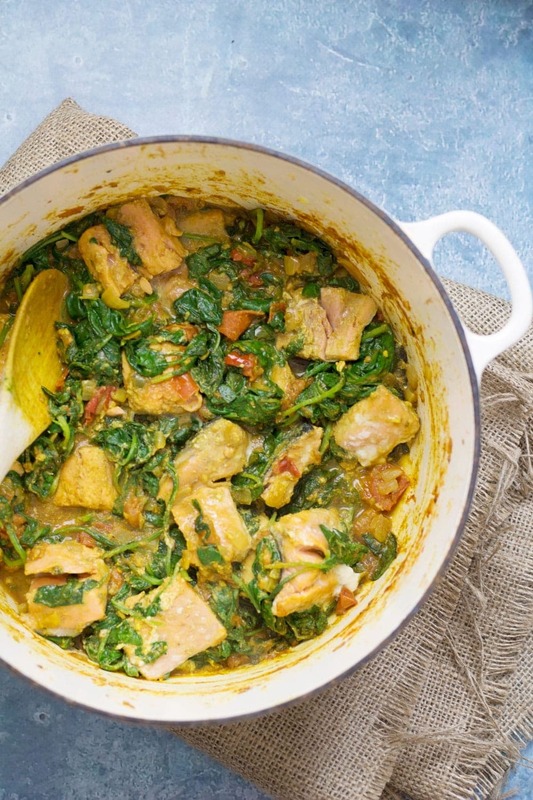 Head over there for loads of ideas for quick dinners you could cook this month and a couple of recipes which would be perfect for celebrating with and sharing with friends and family over the holidays! So about this peanut salmon recipe. It’s one of those meals that feels super indulgent but is actually really healthy. That peanut sauce gives the whole dish a creaminess which you just can’t beat. 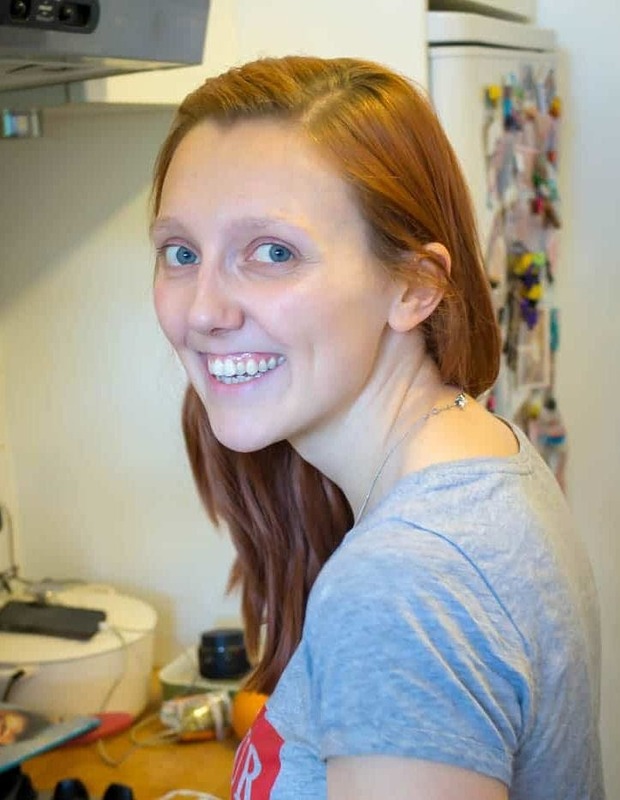 I happen to love peanut sauces, they’re so good and so easy to make! Everything else is pretty fresh and simple. 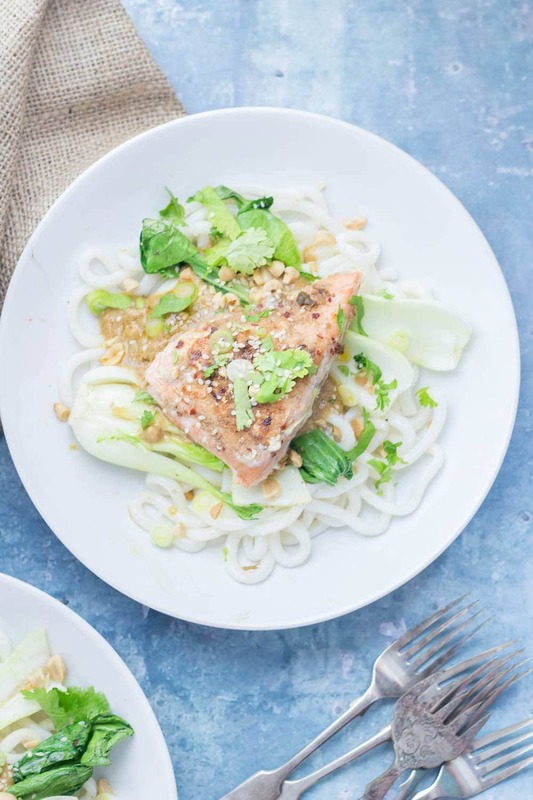 The pak choi is quickly wilted and the salmon is fried and served on top of some freshly cooked udon noodles. 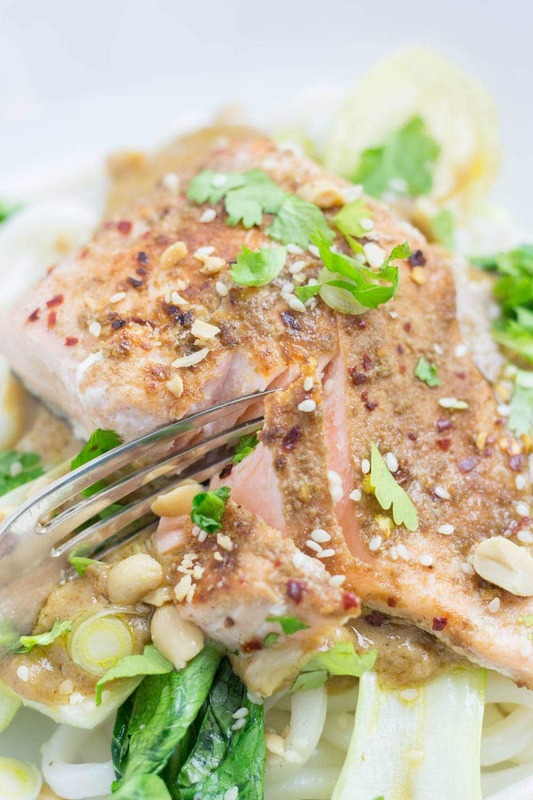 Like the best weeknight meals this peanut salmon is all on the plate in about half an hour. 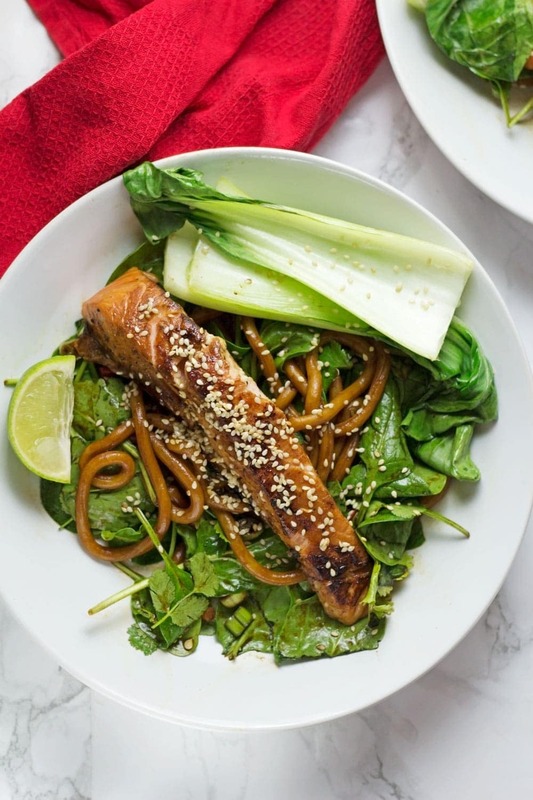 WONDERING WHAT TO DO WITH THE LEFTOVER INGREDIENTS YOU’VE GOT FROM MAKING THESE PEANUT SALMON NOODLES WITH PAK CHOI? Start by coating the salmon fillets in the garlic powder, ginger, chilli powder and coriander and a sprinkling of salt and pepper. Set aside. Make the peanut sauce by heating the vegetable oil over a medium heat. Add the garlic and cook for a couple of minutes then add the curry powder, cayenne, chilli and garlic powder and cook for another minute. Pour in the coconut milk along with the brown sugar and peanut butter. Bring to the boil and simmer for 10 minutes until it's thickened. While the sauce is thickening heat a tablespoon of vegetable oil over a high heat in a frying pan. Cook the salmon fillets skin side down first being careful not to move it around too much so that you get lovely crispy skin. After about 5 minutes flip the salmon fillet and cook for another couple of minutes on the other side (how long will depend on the thickness of your salmon). Remove from the pan. Once you've removed your salmon fillets from the frying pan, add the pak choi, cut side down, and cook for a couple of minutes until wilted. Finish the sauce by stirring through the sesame oil. 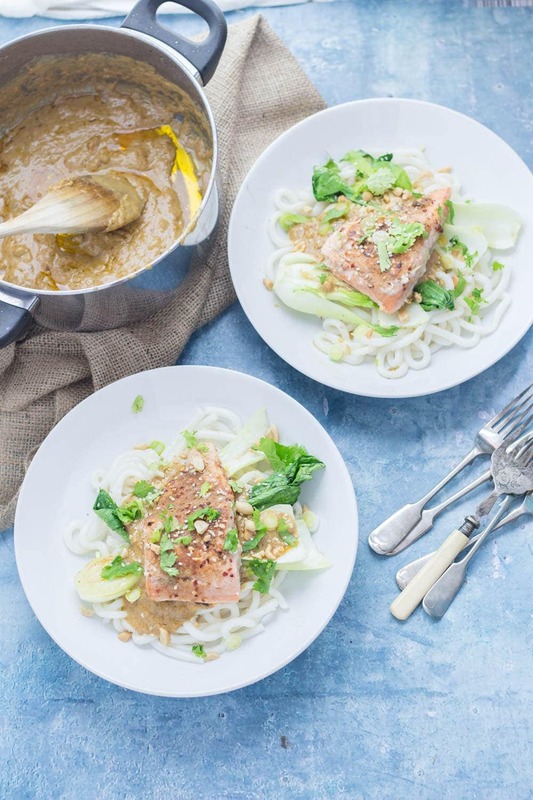 Serve the salmon and pak choi on udon noodles with the sauce on top. Sprinkle over sesame seeds, chopped peanuts and coriander. This sounds absolutely delicious! I’d like to slather that Peanut Curry Sauce on EVERYTHING!!! Hope you have an amazing Christmas Dinner! Oh, hello… PEANUT CURRY SAUCE? I’m all over that. Sounds like a delicious dish! Merry Christmas! Salmon is my favorite! This looks so fresh and tasty! We eat salmon at least once a week, it’s our favorite fish, and this recipe puts our everyday meals to shame, what fabulous flavors, I can’t wait! My family loves salmon and we’re always looking for new recipes to have more salmon! This recipe looks like one we will definitely love!